Not one affordable home was built in 2017 and the government did not meet its new social house building targets as the homelessness and housing crisis continues to worsen. That is what the headlines on news articles covering the Minister for Housing’s ‘Social Housing Delivery 2017’ statement released this week should have read. Instead we had articles like this one from RTE stating that “Department of Housing figures show social housing delivery exceeded”. Again it’s a case of manipulation of figures, spin, and half-truths being put out by Government Departments and Ministers that were left largely unchallenged by the mainstream media. The reality is the homelessness crisis is worsening. Just in the last year the number of homeless families has increased by 26% (from 1,205 in Nov 2016 to 1530 in Nov 2017) and the number of children homeless increased by 30% (2549 to 3333). On this government’s watch, an additional 784 children, or two children a day, became homeless into emergency accommodation the last year. The number becoming homeless was even larger (Focus Ireland figures show 85 families newly homeless in Dublin alone in November 2017, or over two families a day). Why will the government not declare this human catastrophe a national emergency and give it the political attention it requires? The housing crisis also includes low and middle income households in the private rental sector who continue to be affected by rents at ever more unaffordable levels and they face the constant threat of losing their home by being evicted by their landlord. For those hoping to buy a home, house prices are also rising further pushing a permanent home in their community out of reach and meaning, if they do get a mortgage, it will be even more unaffordable to them. To really address the crisis the government should be building a minimum 10,000 social housing units and 20,000 affordable housing units per annum (10,000 affordable rental and 10,000 affordable purchase). This new building by local authorities, and not-for-profit housing associations (and a new housing and homes agency which should be set up to drive delivery) is essential because it would actually increase the new supply of housing and thus address the heart of the crisis –the lack of affordable housing supply. Meanwhile in this Republic of obfuscation, the government claims that it met the social housing need of 25,892 households in 2017 and “exceeded its overall target for new social housing supports”. This gives the impression it provided a significant new supply of housing. But the overwhelming majority of these, 73% (18,900) are where low income households in the private rental sector are given housing support. This is not new supply – it is using existing housing stock in the private rental sector – and so making the crisis worse by adding to demand in the private rental sector. Neither is it social housing as we would understand it – a secure home. Landlords can evict these tenants easily as they can others in the private rental sector. It is also very poor long term value for money as it is a huge corporate welfare transfer to landlords –almost €500 million per year to some of the wealthiest in society for which the state gets no long term return. So if we take away the housing provided under HAP, RAS and leasing from the private sector that leaves 6,268 new social housing units. 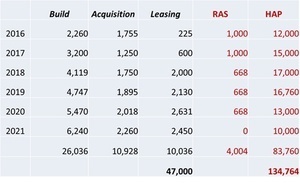 Now, that is still not new build social or affordable housing supply, 1757 of this is existing local authority housing being refurbished (referred to as ‘voids’) and 2,266 is acquisitions, or purchases from the private market, again, not new build supply. That leaves, just 2245, of which 388 is bought from private developers in Part V. This means that in 2017 the total actual new build social housing was just 1,857 (1,058 by local authorities and 799 by housing associations). Therefore, of the new social housing trumpeted by the government in their statement this week, just 7% is actually new build social housing. At that rate of building it would take over 50 years to meet the housing needs of those on social housing waiting lists. The facts are that the new build of 1,857 (or, 2,245 if you include Part V units) doesn’t even meet the government’s own housing plan Rebuilding Ireland targets – set out in July 2016. The tables below shows that the new build targets for 2017 were 3,200. So the actual new build is just over half the Rebuilding Ireland targets. Minister Eoghan Murphy said on the release of the statement that “Rebuilding Ireland is working”. The truth is Rebuilding Ireland is not working and the government is not meeting its targets. The overall Rebuilding Ireland housing strategy is actually going to continue to make the crisis worse because it is not providing a significant increase in affordable and social housing supply. There is no sign of the government building actual affordable housing, like affordable rental and social housing any way near the scale required. 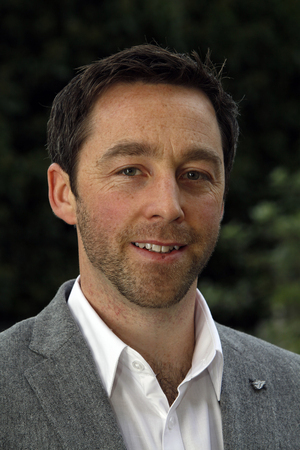 It has money to invest in building social and affordable housing – such as the hundreds of millions planned to be given away in tax cuts, the €1.3bn allocated to a ‘rainy day’ fund and instead of allocating €750 million to finance private developers that should have used it to seed fund the setting up a of new semi-state affordable homes building company that would actually build affordable homes. The state through local authorities, and state agencies and NAMA has significant land banks that it could be building affordable housing on now – and not be waiting for the private sector to build. The State Lands Management Group identified a tranche of public land including 700 local authority and Housing Agency owned sites (totalling some 1,700 hectares), and 30 sites (200 hectares) owned by state or semi-state bodies in the Greater Dublin Area and other major urban centres that could build up to 50,000 homes. Instead we have 3,333 children with their childhood being stolen from them as they are left languishing in emergency accommodation and Family Hubs. 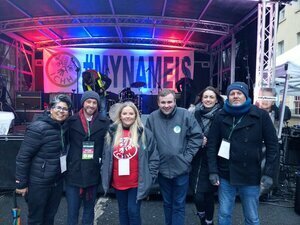 Myself and others in #MyNameIs highlighted their plight this morning by standing in the cold outside government buildings and greeting the Taoiseach on his arrival to work (at a tardy 8.20am! ), unfortunately he drove straight past us and didn’t take the time to listen to our concerns. 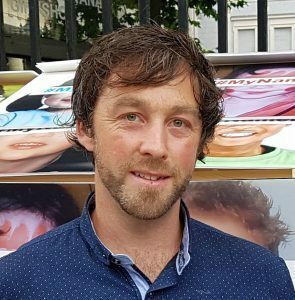 Instead we have hundreds of thousands of young people, couples, families, the elderly, migrants, Travellers, those with disabilities and many others denied their human right to housing–as they are left in the private rental sector, at home overcrowded with family, couchsurfing, or in emergency accommodation and Family Hubs -languishing in unaffordable and inappropriate housing. Welcome to Leo’s Republic of (Unequal) Opportunity. Posted in Misc and tagged Dr Rory Hearne at 3:43 pm on January 16, 2018 by Rory Hearne. Lots of stats (yes, things are bad) and emotive language but little in the way of actual solutions. and no, pointing out that there is land available isn’t enough, the crash showed that we can’t just build in any free space. If the state is has the finance and the land to build vast amounts of affordable housing. Who actually delivers the project, who hires the labour bearing in mind employment at the moment, what is an acheivable timeline? There should be “emotive language” when talking about Ireland’s undeclared National Emergencies in Homelessness and Housing because they affect real people, families and children, which needs URGENT action! 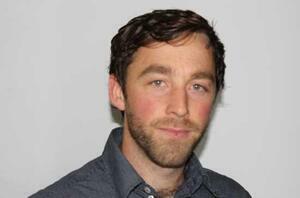 Dr Rory Aherne always highlights properly where the problems are and suggest solutions. State says finance is not a problem but the problem is policy/policies:building social housing been replaced with overemphasis on private rented accommodation as seen above. Also from 2011-2016 the total housing stock increased by just 0.4%(8,800) & limited supply leading to increase in house prices. Problems: Homelessness and Housing Emergencies. Causes:eg:Policies of rapid decrease in housing stock since 2011(0.4%) rapid decline in social housing builds and replacing social housing builds with private rented accommodation. 1)Declare National Emergencies in Homelessness and Housing. 2)Set up a National Emergency Co Ordination Group& Government to oversee emergency urgent plans to deal with emergencies including legislation re fast tracking large stock of social housing construction (Gov said money no problem! 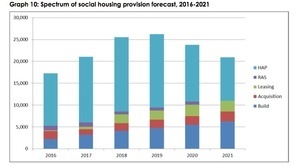 )(Gov after all were talking about fast tracking building of Digital/Data Centres last year) as more social housing built means less reliance on private rented accommodation for “social housing” therefore increasing private rented accommodation for renters so rents should go down. LAs sites should be used for social housing builds not for private rented accommodation.Social housing could also be used to house the 54% workers earning under €30,000. With increased social housing means less reliance on RS&HAP & Emergency Accommodation costs saving state money.That money could go towards Affordable housing schemes. According to Census’16 there were 183,312 vacant houses and apartments:140,120 vacant houses&43,192 vacant apartments so that is potential housing stock also. 1)The “fast tracking Minister Murphy signed on 23/6/17 is for large scale housing developments of 100 units or more &large scale didn’t accommodation projects that would potentially take 6months from pre application stage.It is described as temporary fast tracking until Dec’19.Subject to review until dec2021.How much of that is social or affordable housing or is majority to be rented out? 2)Not declaring National Emergencies in Homelessness and Housing gives the impression that they are not Emergencies requiring urgent action. 3)A large program of social housing builds is needed&for that it’s logical to use LA sites,but if they are mainly used to build houses for private rented accommodation that depletes the amount of land available.I also mentioned in my point that social housing on LA sites could be used for 54%workers( &their families )who earn €30,000& under as it would be the only affordable housing available they could afford. 4)To have 183,312 vacant houses and apartments during Homelessness and Housing Emergencies &not to get use of them doesn’t make sence! Why the heck do you think? If it were their developer buddies or bankers, they’d be running screaming around Government Buildings! This is (sniff) poor people, my deah. b as always the fg contrarion.. It wouldn’t happen in the first place because a genuine left wing Government wouldn’t have right wing policies! (For once) I agree with Rory. The state needs to start building homes ASAP. I’d love to see the land identified by the State Lands Management Group. How much of it is in Dublin, and where. The only thing this neoliberal coalition of FG and FF is interested in is the continuing the corporate welfare of private landlords and private developers. The statistics they offer are lies. But you see, the real problem according to Leo is that the homeless are responsible for being homeless. And that spin is hammered home by FG and its shills every chance they get. 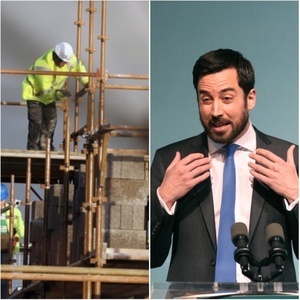 But, but, but…..I’ve seen countless pictures of Eoghan Murphy in action man pose- hard hat on, sleeves rolled up and tie off. Leo there and all.